Medical researchers with American College of Surgeons devised an online system that calculates an individual’s risk of developing complications for nearly all kinds of surgery. The team led by Karl Bilimoria, director of the Surgical Outcomes and Quality Improvement Center at Northwestern University in Chicago, with colleagues from the UCLA medical center and VA Greater Los Angeles Healthcare System, published a preliminary online report of its Surgical Risk Calculator last month in the Journal of the American College of Surgeons (paid subscription required), with the final paper scheduled to appear in that journal later this year. Surgeons lack a systematic, evidence-based method for estimating risks of post-operative complications faced by individual patients that undergo surgery. Providing this estimate is important in patient-centered care, where decision-making is shared with the patients, who can then give genuinely informed consent. The U.S. Centers for Medicare and Medicaid Services, through its Physician Quality Reporting System, is also expected later this year to require surgeons to provide this kind of risk assessment to patients, particularly for elective procedures. Current methods of estimating risk of surgical complications, says Bilimoria, are often based on anecdotal evidence or, at best, small-sample studies from individual hospitals or physicians. In addition, current risk estimates are generic and not specific to a patient’s unique conditions. To construct the calculator, Bilimoria and colleagues collected standardized clinical data from more than 1.4 million patients at 393 hospitals taking part in the National Surgical Quality Improvement Program of American College of Surgeons. The data also represent more than 1,500 unique Current Procedural Terminology (CPT) codes, standard identifiers in medical practice for insurance billing. 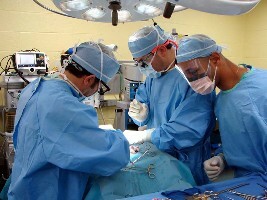 The calculator provides an online form for surgeons to enter 21 factors on the patient’s pre-operative condition that the system then uses in regression models to estimate potential risks of eight post-operative complications and overall mortality, as well as providing a customized estimated length of hospital stay. The calculations are displayed compared to risks faced by a typical patient. In addition, surgeons can adjust the calculated risk assessments based on their subjective assessments. The researchers tested the calculator with real-world data and found it could accurately predict overall outcomes, such as survival or serious complications, as well as risks of developing six specific conditions: pneumonia, heart problem, surgical site infection, urinary tract infection, blood clot, and kidney failure. Bilimoria says the calculator will be updated regularly with additional outcomes, and mobile versions are also planned.